Love your gut! That is what the Avisae product does for you. When you take care of your digestive system, your body will reap the rewards. 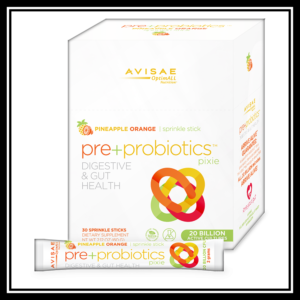 Part of the OptimALL Nutrition from Avisae is the “pre+probiotics™ pixie” which is a proprietary synbiotic blend that helps your bodies gastrointestinal track work more efficiently. My experience with this product is outstanding! Even use it for my children when they are having trouble with their tummies. It is not hard for them to take because it is a pixie and taste good. The WHITE PAGES have some excellent information follow the link to read some more about it. You can by it retail from MY BeneYou WEBSITE through this link. Just a reminder that you can get it at a discount by signing up for a one time fee of $29.95 and a monthly $5 fee for your storefront website that BeneYou maintains for you.